Pavan Kaushik, Head – Corporate Communication of Hindustan Zinc, was awarded with ‘CSR Person of the Year 2018’ at India CSR – Leadership Summit in New Delhi held on 27th April 2018. The award was presented to him for his contribution towards road and industrial safety, through the campaign – “Be Safe-Surakshit Rahiye”. The prestigious award was presented to Pavan Kaushik by Dr. Bhaskar Chatterjee, Former DG and CEO, Indian Institute of Corporate Affairs, and Rusen Kumar, Founder – India CSR Network & Summit. 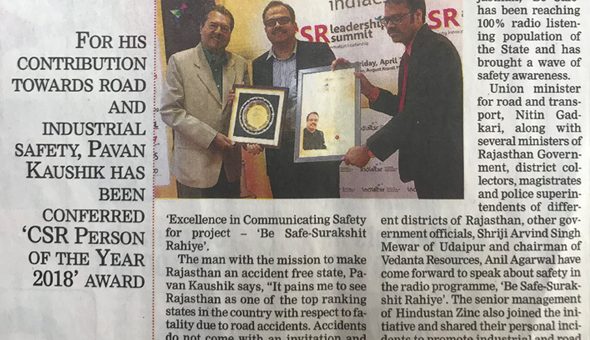 Recently Pavan Kaushik has also been awarded by Udaipur Chambers of Commerce with Mewar Entrepreneur Award 2018 for “Excellence in Communicating Safety for project – “Be Safe-Surakshit Rahiye”. 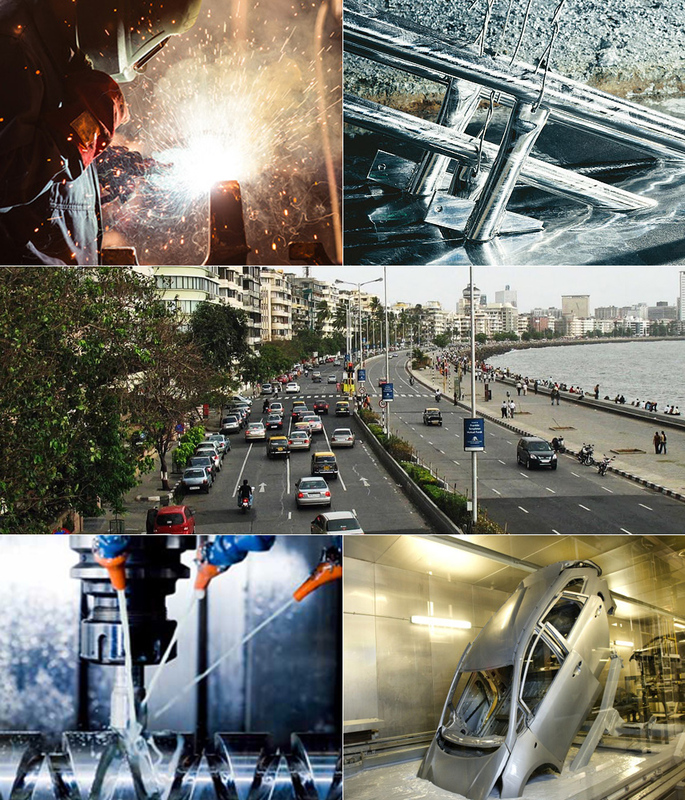 “CSR is a Collective Social Responsibility. It should be a part of self-regulation, which changes and benefits the society in the long run. I believe that the ‘C’ in CSR stands for ‘Character. Unless there are genuine intentions to change the society, the impact of the CSR would never be assessed. This is where the Character (‘C’ in CSR) would matter the most. The people working at ground level would also be different from people just cutting cheques ’, he says. Founder of the project “Be Safe – Surakshit Rahiye”, within a span of 2 years, Pavan Kaushik has interacted with more than 3500 employees, their families and a number of school children through interactive workshops. Getting associated with All India Radio, Rajasthan, ‘Be Safe’ has been reaching 100% radio listening population of the State and has brought a wave of safety awareness. Safety of people has been on the utmost agenda of the central government as well as with the State government. Hon’ble Prime Minister of India, Shri. Narendra Modi Ji, also spoke on road safety his “Mann Ki Baat” program. Honourable Union Minister for Road and Transport– Shri Nitin Gadkari Ji, along with several ministers of Rajasthan Government, District Collectors, Magistrates and Police Superintendents of different districts of Rajasthan, other government officials, Royal Highness Shriji Arvind Singh Mewar of Udaipur and Chairman of Vedanta Resources – Mr. Anil Agarwal have come forward to speak about safety in the radio program– “Be Safe-Surakshit Rahiye”. The senior management of Hindustan Zinc also joined the initiative and shared their personal incidents to promote industrial & road safety. Taking cognizance of the road accidents caused due to mobile usages while driving, the Hon’ble Rajasthan High Court has passed order to cancel licence of all those who are caught using mobile while driving 2-wheeler or 4-wheelers. This is a landmark judgement and would certainly bring down the accidents in Rajasthan. This also re-iterates the message of the campaign ‘Be Safe – Surakshit Rahiye’. Pavan Kaushik is also the founder of the projects “Khushi” and “Sakhi” where he has contributed immensely towards the cause of child care and social & economic empowerment of rural and tribal women. He has also been awarded by India Today, Times of India, Zee TV, Public Relations Society, Udaipur Chambers of Commerce in the areas of social communication.